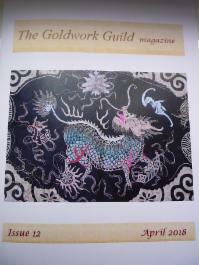 The latest magazine has been sent out to all members of the Goldwork Guild. If you would like to purchase a copy, please contact “TC” Hilliard on enquiries@thegoldworkguild.com for further details. Do you know your Or Nue from Italian Couching? Qilin (Qi Lin) – A dragon?